Ah, Valentine's Day! It is upon us and I can't believe it. One of the sweetest days of the year and I find myself always looking forward to it just because everyone is usually so happy and full of love. Today, I wanted to share one of my favorite cocktail recipes with you just in time for Valentine's Day. I don't know about y'all, but I'm a 'sweet drink' type of gal! The sweeter the better if you ask me. If that is you, then you will LOVE this bubbly sweet drink. I found it a little while ago while browsing on Pinterest and when I made it, I fell in LOVE. I added my own little twist and now I have my husband loving it too! 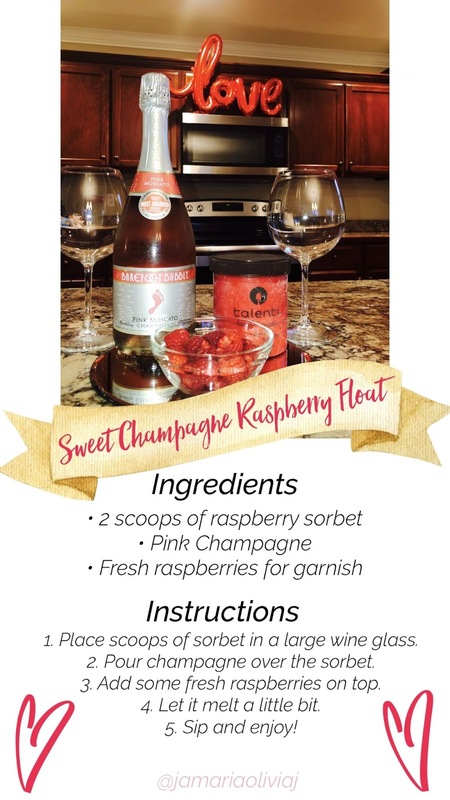 This is the perfect drink to make over a Valentine's dinner or better yet, have it as a part of your dessert! I love that it is so easy to make, yet so delicious. I hope you guys will try it! If you do, please take a picture and tag me on Instagram and let me know how you like it! I want to try some different variations with different sorbet flavors and other types of champagne. I'm wondering how it would taste with lemon sorbet, yum! Yum! This looks delicious. I'll try it out! ooooh, I'm not usually one for sweet drinks but this looks pretty enticing!!! Happy Valentine's Week girl! This sounds soooo good! Thanks for the recipe, I can't wait to try it! Now that looks good! I have to try it!! What a fun and festive drink! It looks so yummy. This looks delish! I'm totally going to try and re-create it. This drink looks so yummy! I love Barefoot drinks! Oh my yum! Sounds and looks right up my alley! Definitely going to have to try! Yum! This looks delicious and I am definitely trying tonight! Thanks for the recipe! This is a must try!!!! Next girls night in I’m going to try this. Looks so good.